» Mike Nevins on BLOOD RELATIONS: FREDERIC DANNAY & MANFRED B. LEE. 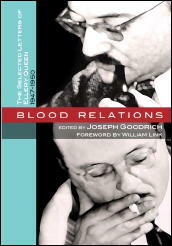 Mike Nevins on BLOOD RELATIONS: FREDERIC DANNAY & MANFRED B. LEE. It’s only January but I find it hard to believe that the remaining months of this year will produce a bio-critical book in our genre more fascinating than Blood Relations. Published by Perfect Crime Books, edited by Joseph Goodrich and with a foreword by master TV mystery series creator William Link, this labor of literary love brings together much of the correspondence between Frederic Dannay and his cousin Manfred B. Lee, the creators of Ellery Queen, between 1947 and 1950 when they lived on opposite coasts. What a treasure! It’s long been known that Fred and Manny had endless bitter disputes about their work, and Jon L. Breen presented a cross-section of this material in “The Queen Letters” (EQMM, February 2005). Now we have thousands of words more, letters that offer literally a blow-by-blow account of the creation of three of the strongest Queen novels — Ten Days’ Wonder (1948), Cat of Many Tails (1949) and The Origin of Evil (1951). Personally, I see Fred as spiritual kin to the great Argentinian author Jorge Luis Borges, who was a Queen fan (almost certainly of Fred’s side of the equation rather than Manny’s) and whose stories like “The Garden of Forking Paths” and “Death and the Compass” are set in the same kind of self-contained Cloud Cuckoo Lands as so many of Fred’s plot synopses were. Manny’s soul brother on the other hand was the character Joel McCrea played in Preston Sturges’ Sullivan’s Travels (1941), a Hollywood director who hates the hit comedies he’s helmed and burns to create a Steinbeck-like “social consciousness” epic called O Brother, Where Art Thou? The miracle is that they managed to stay together, and produce such excellent novels and stories, for so many years. Or was it a miracle? One of the most surprising aspects of these letters is that side by side with the mutual lacerations are moments when each of these highly sensitive men empathizes with the other in times of personal trouble. I was privileged to know and work with Fred during the last thirteen years of his life. I would have given much to have known Manny better but he died in 1970 after we had exchanged a handful of letters and met once. What an amazing pair they were! I buy just about all the mystery related reference books and will have to get this also. Hopefully there will be many letters discussing the operation of ELLERY QUEEN MYSTERY MAGAZINE. I’ll second the motion. It’s in my Amazon cart right now. I think I’m with Dannay! What an essential book. $14.95 is an amazing price too. Any other genre history they do? I don’t see any other mystery reference type books. They’re heavy so far into PI fiction, both reprint and new, and story collections, which I like to see. Fascinating review. Sounds like an absolute must-read. Like many Queen fans I’ve always wanted to know more about how Dannay and Lee actually went about producing their books (in the same way that some would like to know what was Lennon’s, what Macartney’s input into a great Beatles song). I shall be particularly fascinated to learn of the genesis and production of Ten Days’ Wonder, for me the greatest, the most perfectly achieved detective story ever. I’ve finished reading the book, and it is as impressive as Mike suggests. Besides the actual collaboration, the comments about the need for money, for instance, are also very interesting–Lee lived marginally financially. The religious differences between the cousins also come into the book in a minor way. Although the Jewish backgrounds of the cousins has been known for a long time, Dannay turns out to be a practicing Jew, unlike Lee. But, of course, the big story is the details of the emotional collaboration.